I am afraid. It’s been going on for some time now, but I just now realized it because I’m a newbie to this feeling. All my life I’ve lived fearlessly, without regard to personal consequences, at least regarding major life decisions–where to live, what job to take, what insurance to buy. Being single, I had no one to answer to, no one whose life would be affected by the turns I took–right or wrong–no one I had to look out for. It wasn’t from a confidence in my success, but in a stubborn disdain of worst case scenarios–I’d do fine sleeping on the street and scrounging food out of the garbage. What’s the big deal? I had a whole way of doing life that was completely sustainable when I was on my own. Then I got married. to a person who has a very different approach to life and money and jobs and everything. She is not high maintenance at all, but she would be unhappy sleeping in an abandoned storefront and eating dumpster Dominos. So we have to aim a little higher and actually consider risk. I fear that if I push for us to take a big risk and it fails, whether it collapses suddenly or through years of decay (both of which have their own unique awfulness), I will be at fault. And we are both spent emotionally. We have very little psychic capital to use on new adventures, and if we get half-way in and run out of initiative, or the route ends up being twice as long or twice as difficult as we had planned in rationing our energy, or the road we take is a dead-end and we run out of both money and options, or…. What she needs to sustain her life is quite different from what I need. As just one example, the kind of work I have is far more important to me, and the environment we live in is far more important to her. We have very different needs for stability, security, community, challenge, and everything else. But with limited funds, our needs can be in direct competition. If we must sacrifice, how do we divvy that up? It is not an incidental wish list for either of us, but a question of sustainable living. Should she be miserable or should I? (Which is not a genuine question, because if either of us is miserable, we both are. That’s the nature of love.) How do you measure the respective burdens? Or should one of us be miserable in the short term so we can get to a better place? How miserable? Because a certain level of misery is not sustainable even in the short term… and what is “short term”… and what if it takes longer to get to a better place? AAArrrgh! I see we have a big discussion ahead of us. At least I now know what it is about. Today is my eighth day at work without a break and, unfortunately, the first day of our annual paint sale that brings out the hoards. Old timers tell me there will be long lines of impatient customers as we all work madly to mix the colors. This is not my idea of fun. Performance expectations are my kryptonite. When there are only two customers waiting for me, I begin to grow anxious and tense. I dash from one station to another–product shelf to paint mixer to shaker to dryer, prying open one can while tabbing on the computer for another. I tend to make mistakes, which cranks up the volume on my anxiety, and my self-condemnation meter starts to vibrate. So here I am preparing to go to work, knowing my core issues will be flayed for the next eight hours. I hate that my only path to greater health is an emotional gauntlet right smack through the middle of my issues. I’d much prefer to avoid them–get a less demanding job for instance. I’d rather read about how to overcome them in a book, and even take a test. I’m a good test-taker. I’d probably score 100%. Why is it always on-the-job training I need? At least if I could get a breather to center myself… but taking a break while long lines wait for my colleagues would only make me more stressed. And, Lord, don’t over-estimate my capabilities–I’m not ready for someone to call out sick today! It seems the challenges to my issues keep pace with my growth, always one step harder. My prayers as I flail in the rising waters of customer frustration devolve from, “help me be peaceful” to “help me just survive” to “Help!” If maintaining my peace is an “A” for the test, then making it through without growling in self-defensive anger may be a passing grade? I’ll take what I can get at this point. The wise teachers try to calm me down by saying, “It’s all a process.” Yeah? Well, so is drowning! May you all have a blessed, trouble-free day… at least may it be better than mine. “GIT YER DOG OFF MY MAILBOX!” The angry shout came from 100 yards up the hill, from the shadows of the house, and it slapped me back into awareness from my mental meanderings. He was pissed that my dog had peed on the wooden pole of his mailbox by the gravel road we were traipsing. “Sorry!” I called back, but he was not mollified. “YER LUCKY MY PIT AIN’T LOOSE!” he hollered, a veiled threat to sic his pitbull on us if it happened again. His anger seemed excessive to me. Dogs pee on everything, especially anything vertical, and I’m quite certain the neighborhood dogs, all of which run loose, regularly mark every roadside post within miles. Since my dog Mitts had been piddling for the last 5 miles, his tank was empty, so his lifted leg was entirely for show, but that made no difference to the hothead up the hill. That was yesterday, and even as I write, the feelings seep back in–fear and defensiveness towards a world where even pastoral, peaceful spots now feel unsafe–and other nameless feelings flow through, shadows that settle in from being unfairly misunderstood, misjudged, belittled, chased off. Moments before I had been reflecting on my spiritual journey, and many thought streams had unexpectedly merged into a sense of direction for 2015, summed up in the word “courage.” My 2014 focus was “gentleness,” first to myself and then as an overflow to others, and though the visible changes are small, my outlook has started to shift fundamentally. Being gentle with myself has given me some emotional resources for choosing courage. In our culture, courage is a force marshaled against fears, taking a beachhead at first and then slowly conquering more territory. You bravely take the stage to speak or you ask your overbearing boss for a raise, and gradually you become less fearful and more in control of your life. But I’ve discovered a very different take on bravery–my real fears are not out in the world so much as in my own soul, and I need courage not to conquer my fears but to embrace them. In other words, instead of trying to override my fears and silence them, I try to understand them compassionately. Fears are my friends, not my enemies–they are clamoring to tell me something important about myself which I ignore to my own peril. My journey has been completely in reverse of the norm–starting out fearless as a young man (because I was in denial), then learning to recognize my fears, and finally growing to welcome those fears as helps along the way. We are most controlled by the fears we least recognize. As I trudged, I pondered. I have been dodging certain fears, leaving them unaddressed until I had enough emotional resources to open myself to feel their punches without crashing my heart, a truce of sorts instead of a lasting peace of mind. I am finally ready, I thought, to address some of those dark shadows within. Then that loud, angry shout yanked me back to the present and opened a psychological fork in the road–how should I respond to these feelings? As I turned out of sight around the bend, I wondered how to pick my way through the mental debris. Should I try to brush aside his words by changing the subject or argue with him to prove my innocence or castigate myself and resolve to do better? What internal dialogue will protect my heart when it feels under attack? And this odd solution came to me: rather than defend myself, I open myself to feel the sting and understand it with self-compassion. That is the courage I am choosing this year as I support myself with gentleness. This is the next leg of my journey: to sit with painful and scary feelings, to let them course through my veins and pound in my heart, to let them tell me all they wish to say about my own struggles and wounds and skewed perspectives, about my subconscious self-judgments, crazy expectations, and harsh demands, and to lovingly listen and feel sympathy for a boy that has always tried so desperately hard to find the right way and walk it against all obstacles. I need to gently open myself to feel and understand how this world’s edges cut my soul, to follow the contours of each gash with my fingers and trace its origins from the tender vulnerabilities of my early years. Wounds need the gentle touch of sun and air to heal. I’ve been staying with dad for 10 days, keeping an eye on him while his wife is in Australia. Dad is a man of habit, finding comfort in a daily routine. I think he would call it discipline. Each morning he gets up, makes a cup of coffee, and takes it into his office where he has a long-established pattern of devotions: singing old hymns, reading the Bible, and praying through his list of requests. I expect he would feel discombobulated all day if that pattern was knocked loose. 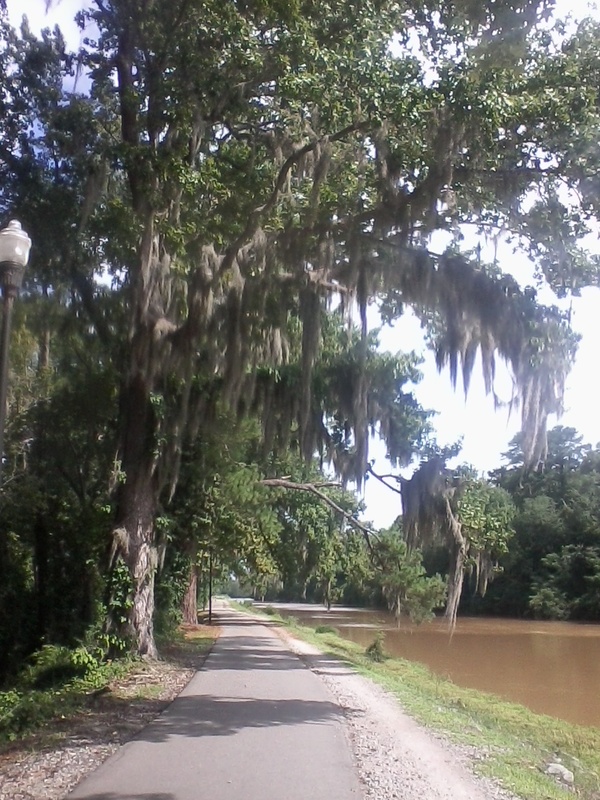 Each morning here I go for a walk along the Broad River Walkway. At first I was taking along Barney, their border collie mix with long, thick, uncontrollable hair, but he kept falling behind, so I started walking alone. The solitude crowded my head with thoughts, mostly reflections on childhood and its repercussions. This morning, prompted by the choruses I sang with dad last night, I headed out to walk with the old hymnbook tucked under my arm. The red cover was warn smooth and dark from years of family devotions, the ancient supportive tape on the corners blending seamlessly. As I stood and watched the water cascade over the spillway that stretches between the banks, I flipped the book open and the pages divided at “Nearer My God to Thee.” Those words dusted off cob-webbed memories of my deeply religious youth when I was “sold out to God” as we called it. I spent hours in prayer and Bible reading, I listened to sermons and worship on the radio, on tape, and at church. I read Christian authors and talked with Christian friends. All this effort was to reach an oasis, relief for my parched soul, but the God I sought was a mirage. The farther into the desert I pushed myself, year after year, the more lost I became, until I was crawling through the sand towards water that wasn’t there, and I finally collapsed. Every step in the direction of a misconceived God is a step away from the true God. I worshiped a God who was harsh and judgmental, and based on these assumptions, all my Bible reading and prayer and devotion simply drove me deeper into this skewed faith. I read verses about God’s wrath and judgment that negated for me any verses about His gentleness and love. Sermons about God’s kindness came across to me as soft and insubstantial, as merely a carrot to get me to work harder at being good so God would accept me. The more I sang “Holy, Holy, Holy” the more unworthy and rejected I felt–who could ever measure up to absolute perfection? I worked to strengthen my faith, but it was faith in God’s power and omniscience and righteousness that were scrubbed of any scent of His patience and mercy and grace. That is, his power and omniscience and righteousness were frightening, not encouraging, the basis for his condemning me, not his rescuing me. Love was there, but it was not foundational as these other attributes were. Fundamentally, God was pissed off at me and could only be mollified by the death of his son. Jesus kind of forced God into accepting me against his better judgment, bought God off so to speak. The harder I worked to be the person God wanted me to be, the more I realized how far short I fell. I heard Amy Grant’s song “My Father’s Eyes” and knew the look in those eyes: eternal disappointment. This was not the kind of error that I could tweak my way out of. It was fundamental, all encompassing. It was not until my worldview, my belief system, crushed me beyond recovery that I was able to let go and discover the God in whom I now believe, a God of infinite grace. It has taken many years to unlearn, discard, loosen my fearful grip from my long held false securities and to cling stubbornly to my new faith, my new God, my new life and relationships… and even a new Bible and hymnbook. Nearer my God to thee.